ENR’s annual Best Projects award program is dedicated to honoring the best construction projects and the companies that designed and built them in all 50 states plus Washington D.C. and Puerto Rico. Projects compete in 20 specialized categories, ranging from Highway/bridge to higher education. Independent juries of industry leaders in design and construction from each of ENR’s 10 regional editions will judge the projects using five criteria, including safety, innovation and teamwork. The winners will be honored at awards ceremonies held in each region later in the year, and will be featured in the regional editions of ENR. Projects deemed best in category will automatically compete in the Best of the Best Projects, a national juried competition appearing nationally in ENR. The project must be built in any of the 50 U.S. States plus Washington D.C. and Puerto Rico. The project must be or will be completed between May 1, 2017 and May 31, 2018. A project with a construction-related fatality, regardless of contractor or trade, is not eligible. There is no limit to the number of projects each firm or person can submit. To submit a project, fill out the entry form which will be available in the spring. Entries may be submitted by any of the firms working on the project, but the most successful entries are joint entries incorporating input from multiple key team members, such as the design firm, contractor and owner. If you have questions about your project’s eligibility, please read the frequently asked questions below. Q: How much does it cost to enter? Will I be required to purchase anything if I win? A: The early bird fee is $50 per entry. Entries submitted after the early bird deadline are $95. Deadlines are listed on the entry website. You can submit as many projects as you like. You are not required to make any other purchase of any kind to be eligible or to win. Options will be made available to you if you wish to purchase additional award plaques for your team, or advertising, but it is voluntary and does not affect any part of the judging or editorial content one way or the other. Q: What kinds of questions are there on the entry form? Can I see a sample entry? A: You can view the entry form by visiting http://enr.com/bestprojects/2017/. The questions will ask for specifics on the project, addressing the five main criteria: 1) Overcoming Challenges & Teamwork 2) Safety 3) Innovation & Contribution to the Industry/Community 4) Construction Quality & Craftsmanship 5) Functionality of Design & Aesthetic Quality. The essay questions addressing these criteria can be up to 400 words in length. Q: I’m submitting a project for the regional “Best Projects” award. Do I have to prepare a separate entry for the national “ENR Best of the Best Projects” competition? A: No, the same entry will be used for both competitions. The best regional projects are selected by committees of judges, in 20 categories. The winners of the regional competition automatically become eligible for consideration in ENR’s national Best of the Best Projects contest. A separate committee of judges picks the national winners. Note that the main winners from each category will move on to the national competition, but Awards of Merit will not. Q: What are the benefits of winning? A: Your project team will earn bragging rights, but in addition, your project will be published in the regional magazines later in the year, as well as the regional websites. All of the regional winners will be honored at special events held in each region. The winners of the regional competition automatically become eligible for consideration in ENR’s national Best of the Best Projects contest. A separate committee of judges picks the national winners, which are published in ENR. Q: The eligibility requirements say that the project must be finished between certain dates. Our project will have its certificate of substantial completion a few days before the close of your competition, but the building won’t open to the public until a month later. Does “Substantial Completion” work for you for the completion date? A: We will accept reasonable definitions of ‘completion’ that make sense for your project. However, please take into consideration that your entry will be judged against other projects in that category based on the text and photography you provide. For projects that fall right on the cutoff, be sure that you’ll have adequate materials (photography, information) on the project to prepare a submittal that will wow the judges. If not, consider waiting to submit next year. Q: Does my project have to be completely finished, or could this include portions of the project being completed? A: Phased projects are allowed as long as the phases are a natural aspect to the job, such as a freeway project that was built in phases, under several, separately bid contracts. If the job was all bid under one contract and the phases were done internally with the contractor (Example: the contractor split the project into separate GMPs internally, but the whole project was under one negotiated bid) then it wouldn’t normally be considered a separate phase. However, if a building’s shell was built under a separate contract from the interior or tenant improvements, then those could be considered separate ‘projects’ (see question below). One exception is in the specialty construction category, in which a subcontractor such as a steel contractor can submit their portion of a project upon completion of their specialty work, even if the total project isn’t complete. Q: My firm built the shell of Building XYZ, but the interior build out (being performed by another firm) is not complete. Is the project eligible for this year’s competition? A: Yes, as long as the shell and interior/tenant improvement work are being performed under separate contracts or phases, you can submit, even if the same firm is performing both. Q: Are we required to have professional photography to submit? A: No, your photos can be good-quality photos taken on the jobsite by a project team member, but they should still meet the resolution and size requirements. Just remember that the jury of industry experts will be judging your project against other projects in that category, so try to select the photos that best capture the uniqueness and quality of your project. Also, if you are submitting a renovation/restoration project in any category, it’s a good idea to include at least one before-and-after photo (that is mandatory if you submit it in the renovation/restoration category). Q: Your form asks us to attach a project team list. How extensive does this list need to be? We typically don't release all of that information. A: The spirit behind ENR's Best Projects awards is that the competition honors the entire design and construction team behind the best projects in the U.S., rather than just the contractor or designer. We are able to notify the project teams about the award, the magazine articles describing their work and the awards banquets in their region. However, the extent of information you provide on your uploaded team list is entirely up to you, and will not affect the outcome of the judging. Q: Your entry form only allows me to submit in one category. If my project could be eligible in several different categories, which category gives my project the best chance of winning? A: The panel of independent industry judges makes the final decision for the winners in all categories, so there’s no way of predicting ahead of time what the competition will be like in any given category. As you are writing your project narrative, consider which aspect of the project will be the most compelling and the most unique to the judges. An example would be a LEED-certified higher education project, which could go into 'Higher Education' or 'Green Project'. If your project met exceptional green building standards, or used a ground-breaking, innovative sustainable strategy, then you may want to consider submitting in the green category. However, if the sustainable aspects were commonplace, or just one facet of a project with many innovative or compelling aspects, then it might be a better strategy to submit in the higher education category. During judging, the judges are allowed to move your project to another category if it improves your chances of winning. Also note that the safety award is separate -- you can compete in one of the 19 regular categories and in the safety award on the same entry. Q: For the Green Project category, is it required that my project be seeking certification? A: Certification by LEED or another professional organization is not required as long as the project is equivalent to a project seeking certification. The judges will expect the same level of sustainable features as other entries that are seeking certification. Q: Should I submit my solar projects under the green category? If not, do you have a suggestion as to what category solar projects would fit under, if any? A: Yes…. though it depends on how sustainably the construction was performed. Just because the completed project will generate ‘green’ power, doesn’t mean the project was built sustainably. If it was not designed and built in a way that would be equivalent to other green buildings, please consider submitting a power project in the Industrial/Manufacturing category. Q: The rules state that any project with a construction-related fatality is not eligible. What if that death occurred on a different phase of the project? A: Your project is eligible as long as it meets the other rules for eligibility and meets the definition of being a separate phase or ‘project’ detailed in the questions above. Q: Regarding the safety questions, are you asking for project-specific totals or company-wide totals? And should the totals be for the duration of the project or the totals from the calendar year in which the application is being made? A: The safety questions are project specific, over the full duration of the project being submitted, regardless of how long or short the construction duration is. Data should be for that project only. 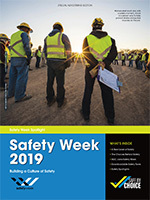 Our industry judges include life-long safety professionals who are fair yet strict in judging the safety criteria, so we recommend you provide open and honest info about your project’s safety record, and be sure to use the text field to explain your safety programs and any incidents. Q: If I submit for the safety award, does that preclude me from nominating my project in one of the regular 20 categories? A: The safety award is separate and doesn't prevent your project from winning in one of the 20 project categories (civil, cultural, office, retail, transportation, green, etc). The entry form allows you to choose one of the 20 categories, and then a separate question asks if you want to also compete for the safety award. A project can win both a safety award and a regular category award if the judges decide the project merits both. Q: Can previous winners submit again if they fit into the time frame? A: Projects that have won previously are not eligible again this year, unless the submittal is for a separate phase (see question about what constitutes a phased project above.) Projects that didn’t win previously but still fit within the current competition’s timeframe may be resubmitted. Consider revising photos or text in your resubmittal to improve the presentation for the judges. Q: I work for the firm that built the light rail cars for Light Rail Project XYZ. Am I eligible to submit? A: Normally, only work directly related to construction is eligible, but there are exceptions. Please contact enr.regional.contests@bnpmedia.com or your region’s editor to provide specific detail about your project. Q: I’d like to submit a project in Canada or another country. Will it be eligible? A: Best Projects 2012 is only accepting entries in the 50 U.S. states, plus Washington D.C. and Puerto Rico. However, ENR is planning on holding a new competition for Global Best Projects in 2013. Stay tuned for more information on this exciting awards program! Q: We were recently contacted by a plaque company that said we were awarded a Best Projects 2012 (or a prior year) award, but the plaque they were selling does not resemble the ones you provide to winners. Is this company affiliated with you? A: You may receive emails or phone calls from firms trying to sell you a generic-looking award plaque, with vague references to your award. These firms have no affiliation with ENR or any other BNP Media publication. Their plaques do not contain ENR logos or other copyrightable content. BNP Media and ENR may work with outside contractors to provide you with high-quality awards and other products, but you can always identify the official awards because they will feature the appropriate logos, the photo of the project you provided, and the specific award name and project name. If you would like to order additional copies of past awards, please contact enreventcoordinator@bnpmedia.com for an order form. Q: My question isn’t answered above. Who can I contact for more info? A: For inquiries about contest rules or the entry form, please email enr.regional.contests@bnpmedia.com.